Is it just me, or does everyone feel a bit jaded, and in need of a holiday at this time of year? Schools break up on Friday here in NZ, and I'm looking forward to a rest from all the rushing around. Like the rest of the country, I'm hoping by then we'll have won the America's Cup race! Currently being sailed in San Francisco, Emirates Team New Zealand are racing Oracle Team USA, and with one race left to win, we are so close. Fingers crossed our boys bring the cup home! I'm actually thinking about taking a bit of time off over the school holidays, so that I can spend more time with my boys. You'll still see me online everyday, on either Facebook, Instagram or Pinterest (that's a given) but the blog posts may cut down to three a week. I'll let you know what I decide by the end of this week, so you know what to expect! Once back from the holidays, I'll be coming at you with lots of exciting new content that I'm working on, including giveaways and interviews. I'm also doing some public relations work for a beautiful new store, and in the early stages of setting up a little interior-related side venture. Lastly, I'm thrilled to have locked in a magazine shoot early next year to have our new home featured. 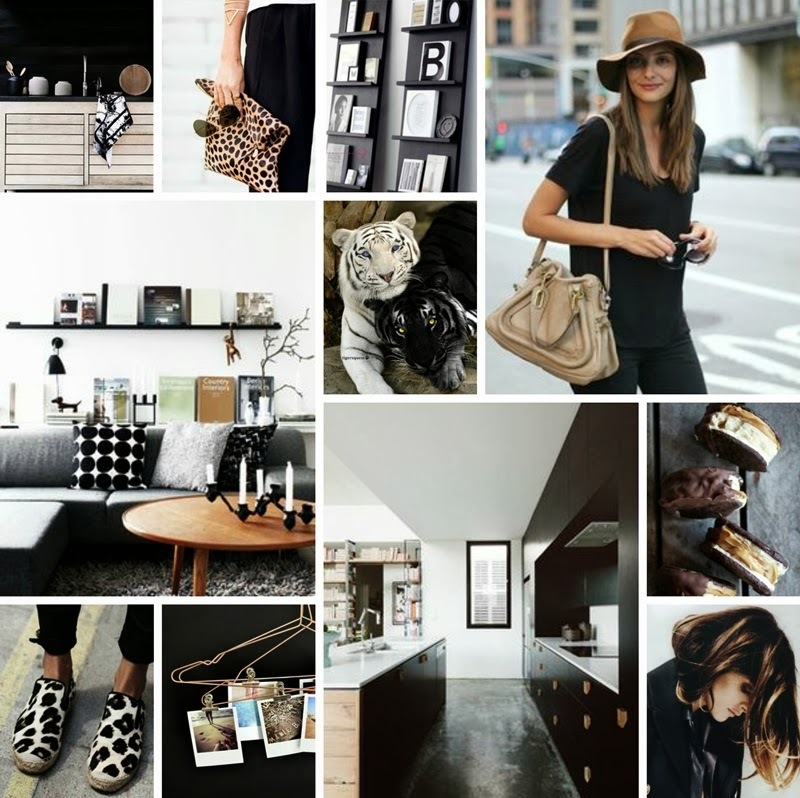 Because of all this busy-ness, I just have a couple of moodboards to share with you today. The first features that exquisite combo of black, white and neutrals together with a few things I'm loving right now such as DIY bookshelves and black interior walls. It also includes some of my fashion must-haves like hats, sunnies and leopard print! This next one was inspired by the arrival of spring and features blush tones, bright airy interiors and beautiful flowers. Enjoy! Thanks Katka. I use Picmonkey, a free web editing program. Enjoy! You will be missed, but I'm sure you'll come back with extra inspiration! Congrats on the home photo shoot - looking forward to seeing that.